Click to take the Ancient Egyptians Quiz! Around 1500 B.C., the ancient Egyptians became interested in the cat because of its ability to kill mice and rats, potential thieves of their stored food and grain. This interest spurred the idea to have cats live in the area of grain storages, and eventually, people’s homes. The Egyptians began to idolize the cat because they saw it as a representative of good by the way it killed harmful rodents. The cat became known as the earthly form of their gods. They didn’t think the cat was a god in itself, only that it was a form through which their gods could come to earth. The cat goddess, known as Bast or Bastet, was a cat-headed women, which eventually turned into a full cat body. Over time, Bastet became known as one of the most important Egyptian gods. 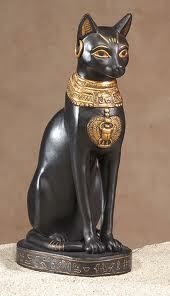 Bastet was associated with happiness, music, fertility, and many other characteristics. In the great temples, real cats were kept and cared for by honored priests. If anyone in Egypt killed a cat on purpose, they recieved the death penalty. A large fine was given if it was accidental. If it was a natural death, it was a time of great sorrow. The cat would be ceremonially buried, and wealthier people would put their cat in a small sarcophagus.